The Infamy Kickstarter has reached another stretch goal, and this one is a doozy… check this bad boy out! Now, I am a big fan of the Infamy sculpts to date – they are all amazing… but… this model has literally blown my mind. James has smashed the ball out of the park with this one, and I can’t wait to get my hands on it. 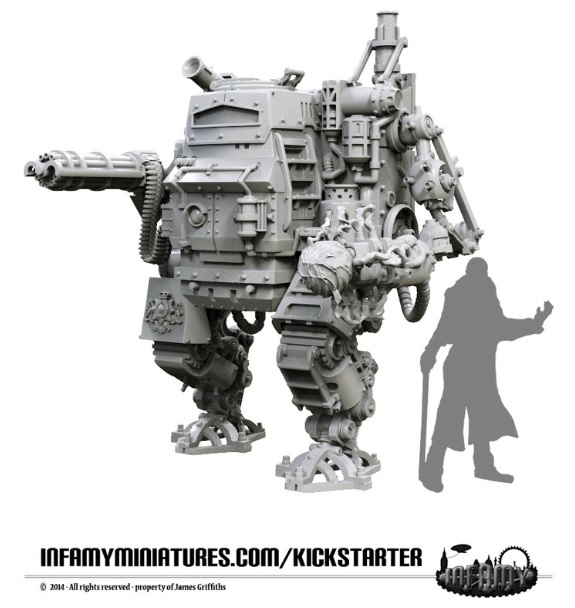 Infamy is 32mm scale, and it sounds like this mini will be the size of a GW Contemptor, so she’s quite a hefty beast but I can see all kinds of possibilities for this kit – playing Infamy for sure, but these will be amazing counts-as Sentinels in a steampunky Guard army…. vehicles do tend to be a bit more forgiving when it comes to scale discrepancies. I think James has hit on a winner here, and I wonder if we’ll be seeing any more Infamy vehicles in the future? Here’s hoping!